The province of Jilin is in the centre of China’s northeast. With a population of over 26 million people, the area covers 191,000 square kilometres. Jilin has 4 different ecologies. To its west are wetlands and prairies. Travelling east there is the Songliao plain, then rolling lowland hills, and finally the forests of Changbai Mountain. The region has 29 nature reserves, a testament to the richness of its environment. The Songliao Plains are also known as “the golden corn strip” and “the hometown of soybeans” and play pivotal roles in China’s food supply. 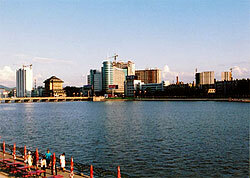 Jilin is one of China’s eight main grazing districts, and its cattle and cattle merchandise are known throughout China. Goguryeo, an old Korean empire, was based in Jilin, and the influence of Korean culture can still be seen in the area. Two thirds of the ethnic Koreans of China’s population live in Jilin. Several of its tombs and fortresses have been cited by UNESCO. Other places of interest in Jilin are Heaven Lake on Baekdu Mountain, near the border with North Korea, which has amazing natural scenery.